The construction of every new building should include fire safety as a key focus – not just in terms of fire prevention, but also with consideration to fire safety and management, should the worst happen. This is especially true when the building is a large office block or perhaps housing many people. 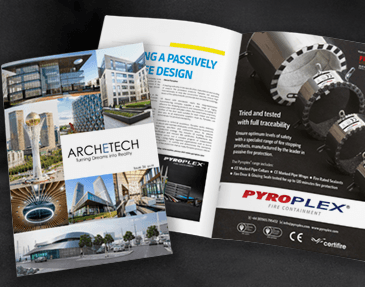 Andy Walsh, Technical Manager of Pyroplex – manufacturer of fire containment products – discusses the key issues around the effective specification and installation of fire doors and seals in this situation. Whilst the outbreak of a fire is never desired, large buildings with the right passive fire protection products correctly installed can compartment the building and slow the spread of smoke and flames. This in turn will provide more time to evacuate the building and reduce the overall fire damage. Amongst passive fire protection products, fire doors are an essential and most effective component – yet only if specified and installed correctly. Not to do so, quite simply risks lives. Far from a standard timber door, the fire door is a highly technical and specifically designed product that has a vital part to play in the fire strategy of any building. And yet to do its job properly, the specification of the door must be correct for its location, it must be accompanied by many other components that are equally fire-resistant and perhaps most importantly, the door must be installed correctly. So, just what should the fire door actually do? In terms of dividing the building into compartments, it must be equipped to retain any fire break-out in that particular segment for as long as specified. The seal must be entire to prevent both smoke and flames from leaking through cavities in and around the door. With that purpose in mind, it is easy to understand why additional components to the door leaf, such as the frame, the glazing, seals and essential architectural ironmongery such as hinges, handles, latches and hydraulic closers must all be up to specification, if a fire is going to be restrained. For example, Pyroplex can supply timber fire door seals that have successfully tested up to FD120, and fire glazing systems tested to 60 minutes. To install proven and tested fire doors, seals and glazing that can hold a fire back for one hour is quite simply, life-saving. And to install a fire door without the accompanying components to enable it to be effective is without doubt, dangerous. Increasing evidence is also surfacing on newly installed fire doors that are not being fitted in accordance with manufacturers’ instructions or even in accordance with industry best practice, Furthermore, many possess no relevant fire test performance results. By choosing to work with certified component suppliers that can also provide relevant test evidence, the above statistics stand a chance of diminishing as we go forward. Such suppliers will also have a wealth of knowledge in this highly technical area and know how to meet and indeed exceed standards to the satisfaction of the regulatory authorities. Where installation is concerned, tools such as BS8214: Timber-based Fire Doors Assemblies can help, as can specialist organisations – for example, the British Woodworking Federation, of which Pyroplex is a member. Responsible for the award-winning awareness campaign, Fire Door Safety Week, the BWF can supply invaluable resources such as the BWF-Certifire Installation Guide. It is imperative that construction companies hire appropriately trained installers, as errors during installation can have catastrophic consequences. As an industry, we need to take steps to ensure that all installers and contractors involved in passive fire protection have the knowledge available to do the job properly. How do fire door seals work? Understanding how a fire door seal works when it is under pressure from fire will highlight exactly why its installation is vital; the door itself is not fit for purpose without the right seal. All designated fire doors and smoke control door sets are in fact provided with an intumescent sealing system. When exposed to fire, intumescent seals will expand, generating high pressure and multiplying many times in volume, effectively sealing the gap between the door and framing section for the required level of fire resistance. In addition to installing an intumescent fire door seal, it is imperative that its specification is suitable for the chosen application. Pyroplex continues to work closely with many door core providers to help them select the right specification of seal to suit the fire door in question. This constructive relationship also puts much technical knowledge at the disposal of the door assembly company. There are several industry recognised third-party certification schemes available, covering a wide range of fire stopping and passive fire sealing products. Independent third-party certification schemes formally assure performance, quality, reliability and traceability of fire protection products. 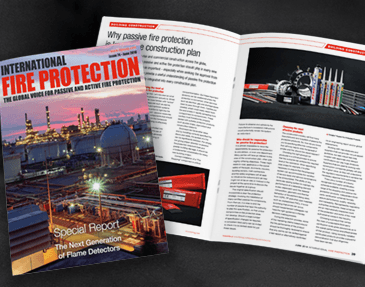 Recognised by regulatory authorities worldwide, these schemes are an internationally respected mark of fire safety and some of the most authoritative voices in the industry. The fundamental benefit of any third-party scheme is focused around giving the regulator, specifier, customer and end-user confidence regarding the stated performance of the product, providing an informed choice when purchasing or selecting such components in the first place. Choosing a product that carries the mark of a reputable third-party certification body gives assurances as to the overall performance and effectiveness of that product. Furthermore, given the varied specifications and requirements of fire doors, test evidence is crucial in demonstrating the performance level of the particular door, when accompanied with the correct seals and components. Specialist manufacturers and suppliers such as Pyroplex will invest much resource into creating reliable test evidence, using reputable fire-testing houses, as this is the optimum way to confidently prove that the specific product formulation does the job required. ASDMA (Architectural and Specialist Door Manufacturers’ Association) is an extremely valuable resource for organisations, when it comes to the optimum specification and installation of timber fire doors and seals. Acting as a knowledge centre for the benefit of both members and the wider industry, with direct influence on UK, European and international standards, ASDMA educates and promotes best practice amongst specifiers, fabricators, installers and other relevant parties on many critical and complex technical issues, drawing on the expertise available amongst the diverse membership across the many product categories. Indeed, participation in third party certification schemes is an ASDMA condition of membership for manufacturing members. Formed in 1990, membership has grown substantially and now includes leading timber door manufacturers, suppliers of hardware, seals, glazing and leading UKAS accredited test houses. The diversity of membership means the association is uniquely equipped to pull together information on all factors relating to the bespoke timber door industry. From such a strong core, ASDMA has its finger on the pulse of all new regulations and standards, always safeguarding the interests of its members. It also ensures representation of the bespoke door manufacturing sector when international standards are being developed. From a practical level, ASDMA exists to support and guide designers, specifiers, fabricators and installers where bespoke timber doors and indeed fire doors are concerned. It offers a huge knowledge and contact base to those organisations that need to work through the technicalities of specifying and installing timber fire doors for optimum results. Comments Mike Wood, Technical Consultant for ASDMA: “The construction industry has come to rely on the knowledge and expertise of ASDMA where the specification and use of timber fire doors is concerned. Our independent advice and guidance on best practice principles can help to ensure that the risk of fire spread in large buildings is kept to a minimum. We urge careful consideration in this area of fire safety, always choosing third-party certified fire doors and accompanying components with suitable test evidence to prove the specification as desired. Having worked with Reddiplex Group since 1983, leading many governmental technical committees in addition to being a UK Principle Expert in many aspects of fire protection, Andy holds a raft of relevant qualifications coupled with unrivalled in-depth technical knowledge regarding fire containment.